The Sn2 reaction and the anomaly of carbon. Digital repositories. An update to the update. A third digital repository has been added to the two I described before. 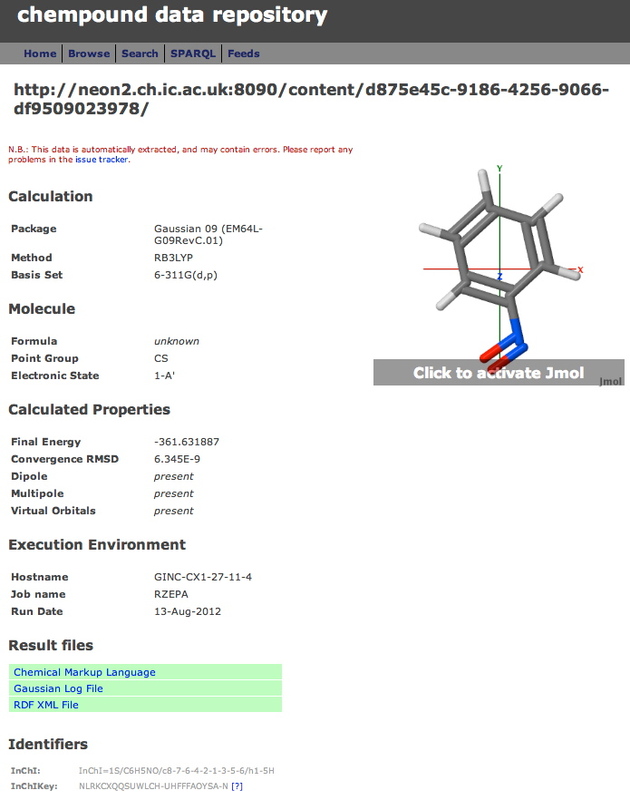 Chempound is a free open-source repository which (unlike DSpace and Figshare) was developed specifically for chemistry. It carries more semantic information (in the form of an RDF triple declaration), which allows SPARQL queries on the entry to be performed. Our original DSpace repository is also being tweaked to allow additional information to be added to existing entries; in particular if an entry is linked to in a journal publication, the DOI of that article is inserted into the DSpace descriptions. It is also relatively simply to duplicate the information in one repository by re-depositing it into another. Thus it becomes feasible to clone the information about the 600+ entries in our DSpace that have been subsequently published in peer-reviewed journal articles, thus adding a measure of confidence to their provenance. This entry was posted on Monday, August 13th, 2012 at 6:33 pm and is filed under Chemical IT. You can follow any responses to this entry through the RSS 2.0 feed. You can leave a response, or trackback from your own site. “•	The mean annual budget of the (38) repositories in the sample is $84,240. Wow, if that were indeed the true cost of running a repository for chemistry, then I think the small number we have would continue to be just that, small! It would nevertheless be interesting to see what the cost of say starting up and operating a Chempound repository would be. I fancy very significantly less than the figures above might suggest. Digital repositories. An update to the update. is licensed by Henry Rzepa under a Creative Commons Attribution-Noncommercial-Share Alike 3.0 United States License.